Cherubs, teddy bears and roses have had their fair share of the limelight — for this year’s Valentine’s season, the Hilton Tokyo is changing things up with lovely chocolate gift sets created on the theme of cats, Paris and strawberries. The sets will be available from Feb. 1 to 14 and can be purchased from the hotel’s first-floor Chocolat Boutique and second-floor Patisserie Filou. The theme was chosen as a fitting accompaniment to the Strawberry Cats Collection dessert buffet currently being hosted at the first-floor Marble Lounge. Stealing the spotlight among the gift sets is the dazzling Cat’s Eye assortment. 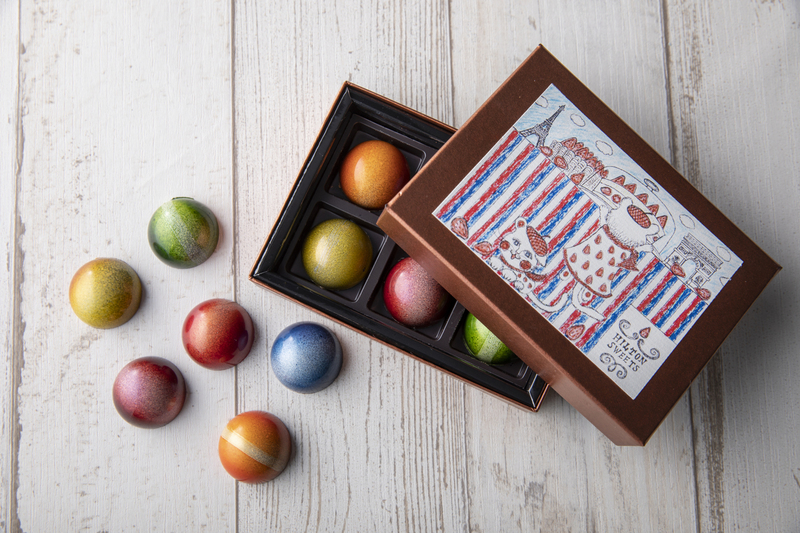 Priced at ¥2,500, the set comprises six extravagant pieces of chocolate ganache — each one uniquely flavored with raspberry and rose, yuzu citrus and passionfruit, salted caramel and other delightful combinations. As an added perk, the box in which they’re presented features an original cat-themed illustration by popular block print artist Mitsushige Nishiwaki. 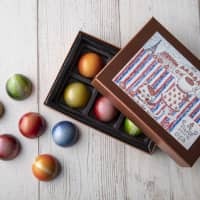 Other hotel creations include the Moulin Rouge chocolate stick set (¥2,000) with ruby chocolate and raspberry, strawberry and passionfruit flavors, as well as the Strawberry Assortment Box (¥3,600) with 11 delectable chocolate truffles arranged in an adorable strawberry-shaped container. The Hilton Tokyo is two minutes from Nishi-Shinjuku Station or 10 minutes from Shinjuku Station West Exit. For more information or reservations, visit www.tokyo.hilton.com or call 03-3344-5111. Valentine’s Day — and its March counterpart, White Day — can always do with more chocolatey goodness. 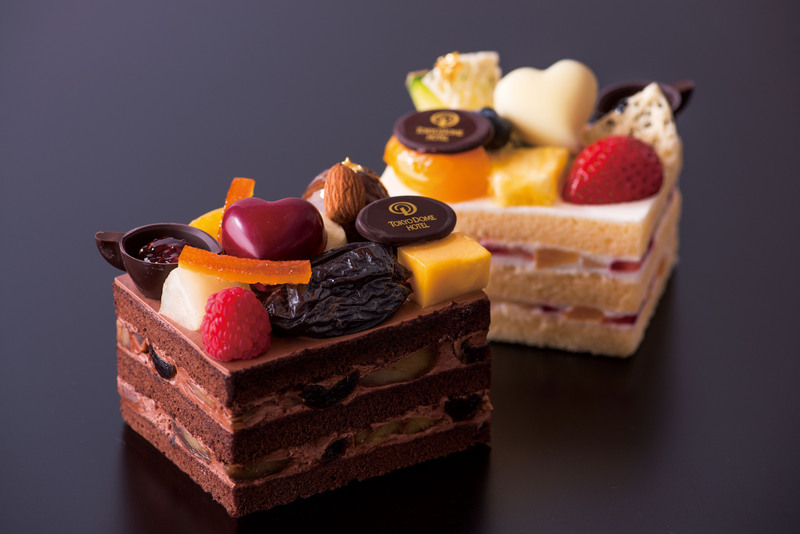 That’s why the Tokyo Dome Hotel has decided to craft two decadent desserts in celebration of the love-filled days. Both confectionery creations are priced at ¥972 and will be served at the hotel’s first-floor lobby lounge Garden Terrace between 9 a.m. and 10 p.m. during their respective months. Their design was overseen by hotel patissier Michiharu Ito, a past winner of the Relais Desserts Charles Proust Competition. The Valentine’s Chocolat Noir is available from Feb. 9 to 14. It’s comprised of chocolate sponge cake with ganache cream and chestnuts and topped with amarena cherries, pear, banana, mango and other fruits. It’s also adorned with a tiny chocolate cup filled with raspberry jam and a chocolate heart flavored with black currant liqueur. Meanwhile, the White Day Chocolat Blanc will be available from Mar. 9 to 14. It features sponge cake with white chocolate cream, apricots and white peaches and is crowned with melon, papaya, blueberries and more. This delectable creation also has a small chocolate-made cup filled with honey with a ganache heart in the center. Through April 28, the Hyatt Regency Osaka invites guests to their strawberry dessert buffet at the Lobby Lounge on the first floor. This “Grove of berry” buffet (with free-flowing tea and coffee) — available on weekends and holidays from noon to 3 p.m. and 3:30 p.m. to 6 p.m. for ¥4,900 per person — features a lavish assortment of enticing berry delights as a treat after a long week of work. Items include strawberry pistachio mousse; a mousse topped with deep red icing and a delectable pistachio flavor, as well as Black Forest cake with French Morello cherries and light strawberry chocolate cream topped with chocolate shavings. 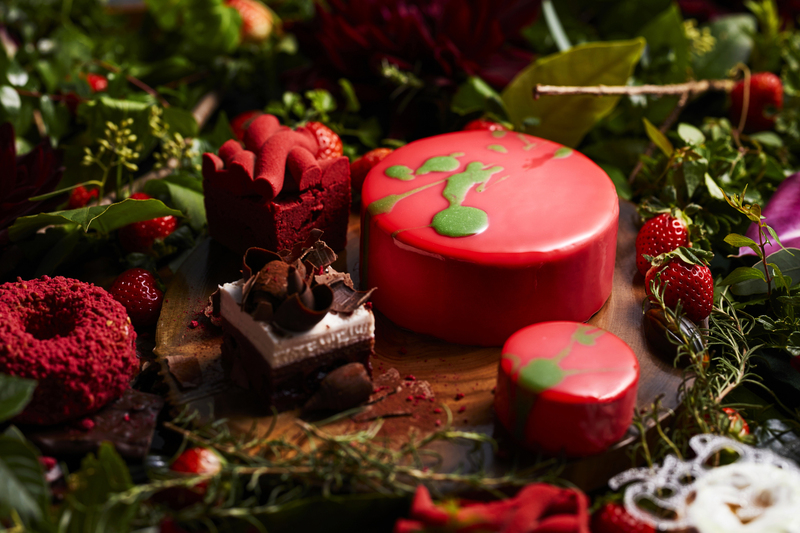 There is also the strawberry brownie, a visually stunning treat made with unique strawberry jam and topped with dark chocolate cream. Created with extremely delicate techniques and prepared over the course of three days, this brownie will please the eyes and deliver the ultimate balance of dark chocolate and strawberry flavors. For those wearing red clothing or strawberry patterns, there is a discount of ¥400; groups of seven or more will also receive a strawberry cocktail in a giant glass to share. The Hyatt Regency Osaka is eight minutes from Trade Center Mae Station on the Nanko Port Town Line. For more information or reservations, visit https://osaka.regency.hyatt.com/en/hotel/home.html or call 06-6612-1234.